Looking for that perfect Father's Day gift this June? Want to get something cool for a well deserved graduate? Do they enjoy freshwater fishing? Well, we have some great ideas for giving that special someone a nice gift for Father's Day that they should be excited about receiving. Fishing equipment and tackle are great to give away for just about any type of special occasion. Father's Day and Graduation Day make no exception either. It's a perfect opportunity to involve people into the fun sport of fishing, while expressing how much you care and appreciate them at the same time. Even if they might have a boat load of fishing gear, many anglers usually feel that they either need something else or that they can always use more fishing accessories to add to their supply. And a beginner may feel ecstatic to be adding to their newfound growing collection. Shopping Tip: Keep in mind that there's quite a few items of fishing tackle that can be used to fish for and catch multiple species of fish. For example, an item may be referred to as a largemouth bass lure, however, that same lure may be used to catch something like walleyes or striped bass. The possibilities of what to buy may seem endless. Here are a few Father's Day gift ideas that you almost cannot go wrong with. By the way, these fishing gift items can be found online at Bass Pro Shops, Amazon.com, or Magazine Agent. Fishing magazines are like a gift that keep giving. They arrive all throughout the year with new information in each issue for every season, which makes for a great Father's Day gift. Watching fishing videos is a great way to pick up helpful tips and techniques, as well as inspiration for being out on the water. New releases, combo packs and best sellers should be the ticket. Looking for that "wow" factor? New fishing tackle constantly hits the market every year, but there are a few that are just cool to have. Find out about some award winning products from expos and sport fishing trade shows such as ICAST. Every angler absolutely needs some sort of a storage system to contain and organize their gear. Tackle boxes are good for carrying around, tackle bags are nice to strap over a shoulder and go, while tackle bags are perfect for backpacking around the mountains to a stream or river. Just selecting a fishing rod or a fishing reel each on it's own might be a drawback, unless you know exactly what they want. However, the advantage of purchasing a rod and reel combo is that those two are already perfectly matched together and ready for fishing. We all know our Dad quite well, right? So, why not hook them up with a fun personalized Father's Day gift? Whether they intend on using it often, or just admire it, I'm sure they would get a kick out of it. A fishing lure kit is one of my favorite gift ideas. Kits seem to be simple items to grab, yet really effective to add to any fisherman's tackle box collection. They come in a variety of colors and shapes to accommodate all types of conditions out on the water. 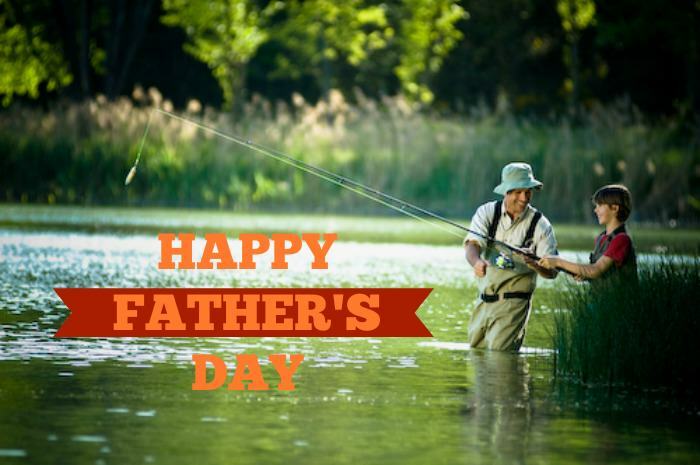 Does that father figure in your life enjoy tying on a fly and flinging it around a nice cool stream or creek bed? Maybe some brand new waders or a vest might uplift his enthusiasm to head out and make a few casts. I hope that you have found these Father's Day gift ideas helpful for selecting out a cool, fun or unique gift for that #1 Dad or graduate. If possible and the opportunity is there, why not spend some time fishing with the ol' man. Perhaps the both of you already do share the passion of freshwater fishing together. We all would love to check out any of your fishing pictures and stories too, whether you've caught fish or not. Have you gifted something spectacular, crazy, or just cool to a father that was a hit? Have any suggestions that you think should be included with the list above? Need help searching for a particular product? We encourage you to contact us to hear your feedback. As you can see, here are a few of our favorite affiliated website sponsors. If you're in doubt at all about what to get your Dad for Father's Day, you really can't go wrong with a gift card. This ensures that he will buy himself something that he actually needs and wants to have. I'm about certain that you can load up these gift cards with any amount of cash that you wish.